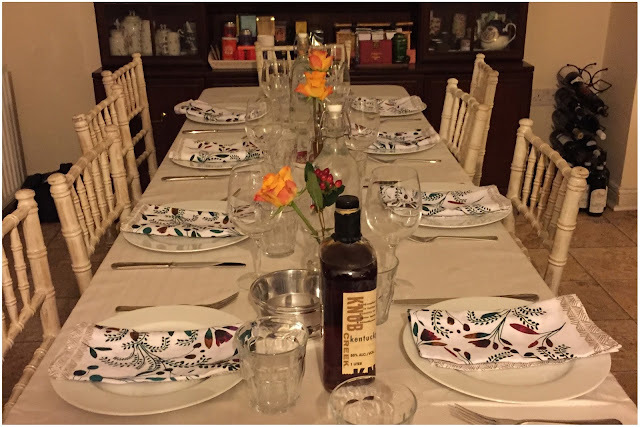 This beautiful table setting before your eyes is the work of hostess with the mostest Miss KK - every year for the last few she's invited a small group of us to come over for a tasty feast and to just enjoy each other's company. Though I may not be from the US of A, I love being part of this particular holiday with KK because when you're far away from home your friends really do become your extended family, something I have always appreciated in my own life. Most of us might feel thankful for different things as we go about our everyday, but how often do we ever stop, share and acknowledge what we're most thankful for amongst good friends and family? I like that at least once a year I get the chance to do just that. So much can happen and change over a year that the good things, big or small, can easily pass us by or get forgotten. The other bonus of Thanksgiving? I also get to learn a new recipe and eat a whole lot of great food! 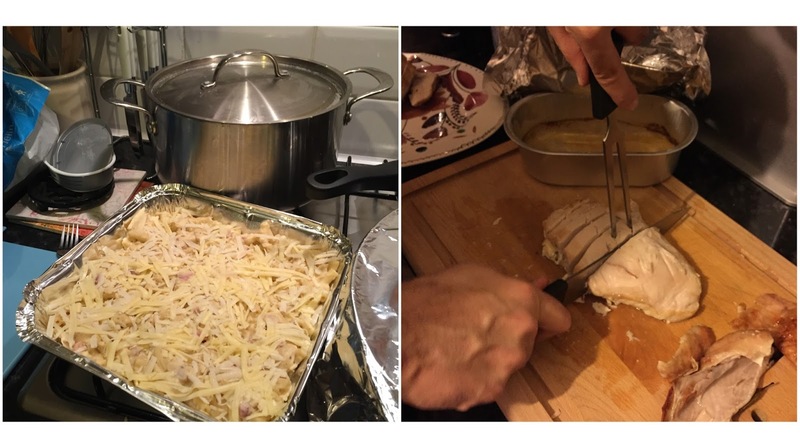 You can't rock up to Thanksgiving empty handed - everyone has to pick a dish, get a pre-approved recipe from an all American cookbook, attempt to cook that dish [interpretation of US measuring chat needed] and bring it as their contribution to the big feast. There's a lot of cooking, carving and organising involved but it's made easier with everyone helping! 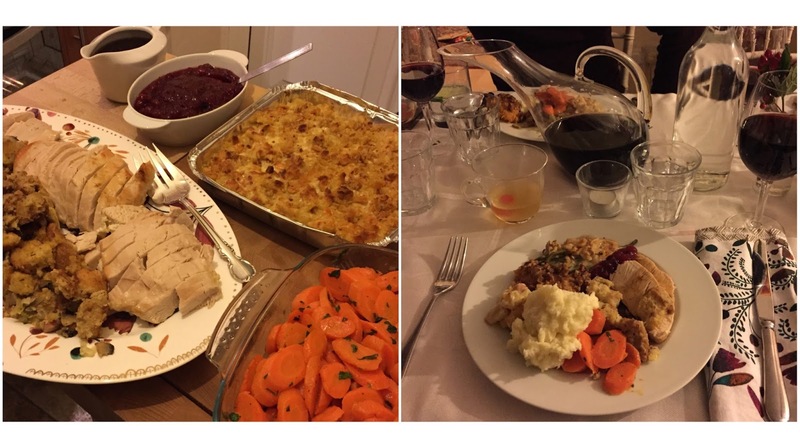 included: turkey, stuffing, mac n cheese, steamed carrots, green bean casserole, mash potato, sweet potato soufflé, cranberry sauce & gravy. 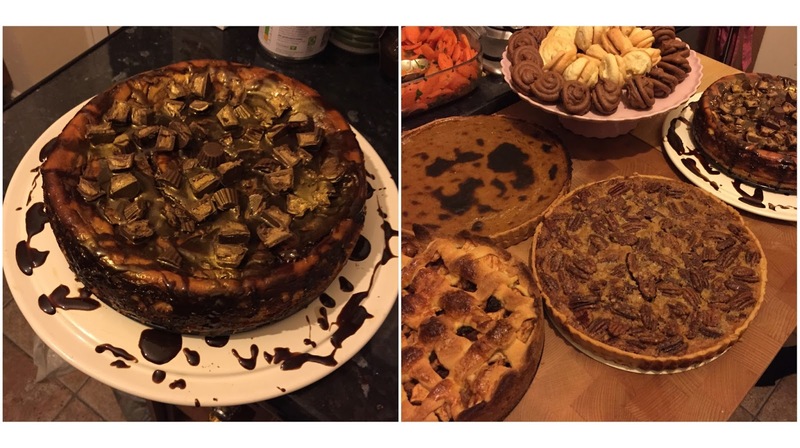 included: baked peanut butter cheesecake, pecan pie, pumpkin pie, macarons & Dutch apple pie. The whole food situation was epic and I am always impressed by everyone's efforts coming together into one tasty meal. Even though I felt like I ate a small mountain of food last night, KK still had a bigger mountain of leftovers at the end of it. I shortly fell asleep in a happy food-coma, lulled away by everyone's chatter around me, so that when I woke up I would be ready to think about what to put in my doggie bag. I'm going to be honest, Round Two of Thanksgiving dinner today was 100% legit.